February 1940. "Truck driver in diner. Clinton, Indiana." Medium format negative by Arthur Rothstein for the Farm Security Administration. View full size. Submitted by davidk on Mon, 02/19/2018 - 7:32pm. Short for phosphate. I have found kali phos (potassium phosphate), ferrum phos (iron), calc phos (calcium), and mag phos (magnesium), all homeopathic treatments for a range of ailments from pain and fever to anxiousness and sadness. But I haven't been able to find an image of those 1940 tubes, and I can't make out the word to the left of PHOS on the display panel. Sometimes it pays to do internet research, or just ask. Submitted by indydad on Mon, 02/19/2018 - 2:52pm. 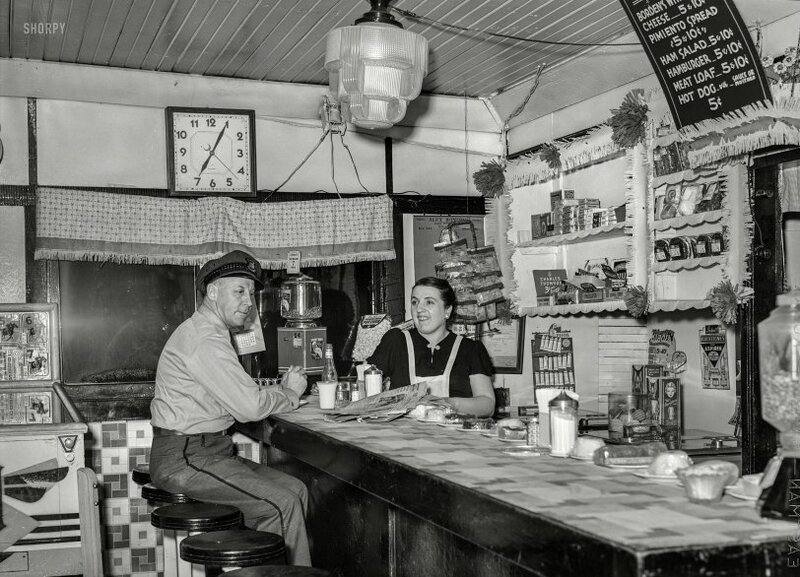 "We received your inquiry on a picture that was found of a 1940s diner in Clinton Indiana. "We believe that it was the Speed Grill on 114 N. Main St. Submitted by Alex on Fri, 02/16/2018 - 9:01am. 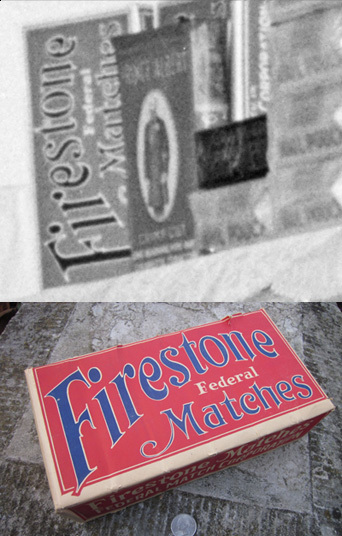 I wonder what kind of product is sold under the brand Firestone: "Mar..tips"? or ".......ES"? What's in the tubes -- Answered? Submitted by indydad on Wed, 02/07/2018 - 9:28pm. If you check the illustration above the tubes, you'll see a hand pouring a tube's contents into a glass. This leads me to believe it's either a headache powder, or something akin to Alka-Seltzer. Submitted by Vintagetvs on Tue, 01/30/2018 - 8:02pm. My Cousin the Pinball Guru came up with a make and model for the Pinball Machine. 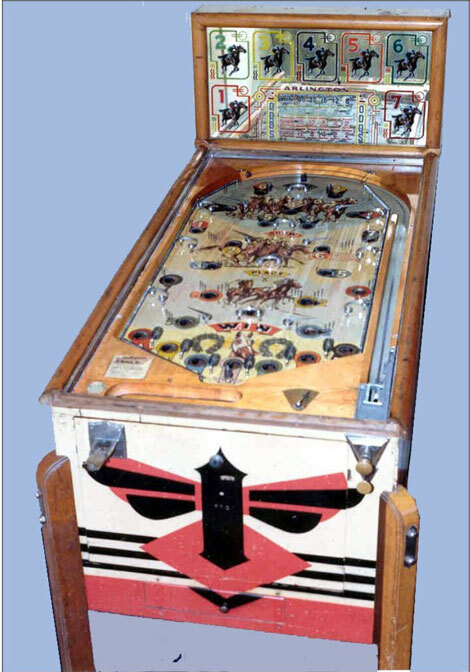 It's a 1937 Bally "Arlington" Probably named after Arlington Park in Illinois, Bally was based in Chicago. Who knew there was an Internet Pinball Machine Database. Submitted by indydad on Tue, 02/20/2018 - 5:40pm. Note the transformer and wires up on the wall (next to ceiling light) probably leading to a neon sign in the window behind the valence or maybe an outside sign. The way the wires are strung and the way that switch is wired to the overhead light, I predict a fire in their future. Especially since someone spent all that time, cutting up crepe paper to trim the shelves. I wonder about the condensation on the window indicating the temperature outside. Probably the result of all that cookin' going on inside. If you have pots boiling or a steam table holding food at temperature, you would get condensation inside the windows. Also very surprised to seen "whoopie pies" on the desert shelf, a Pennsylvania delicacy. Finally, I note the "Sanitary" nut dispenser. "Sanitary" was a big buzzword then, even to the point of there being diners named "Sanitary Diner" in Indiana back then. What's in the little tubes? Submitted by crazyanglo on Sun, 01/28/2018 - 1:26pm. The name is obscured. Something-phos? Submitted by Jim Dandy on Sun, 01/28/2018 - 6:04am. Charles Thomson. 3 cents each, or five for 15 cents! Submitted by William Christen on Sun, 01/28/2018 - 4:56am. 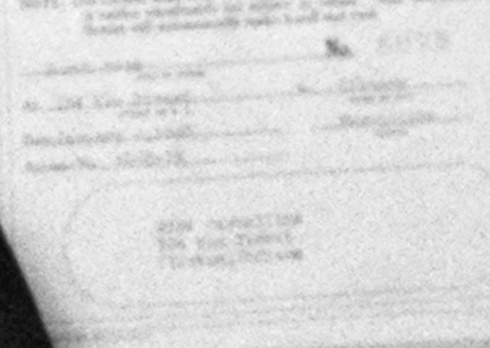 Can anyone zoom in on the Store License (over the shoulder of the waitress)? 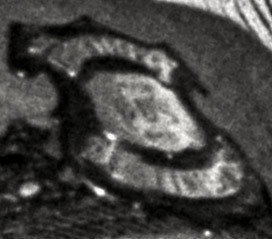 The address and perhaps the name of the owner might be legible. Clinton is not that large a town. I suspect it might have been near the bus station--when it existed. Submitted by Jeb70 on Sat, 01/27/2018 - 11:36pm. Look at the condensation on the window. Not a good night to be outside in your shirt sleeves. Submitted by HAL on Sat, 01/27/2018 - 10:01pm. The gentleman looks like a street car (light rail) conductor. There was a spur of the Terre Haute, Indianopolis & Eastern Traction Co. that ran up to Clinton from Terre Haute. Clinton was a small town of about 7,000 residents at the time. About 3,000 of these residents have strong ties to Italy because their parents or grandparents came from Northern Italy. Submitted by Tobacconist on Sun, 01/28/2018 - 1:36am. The driver is reading the February 19, 1940 issue of The Daily Clintonian. 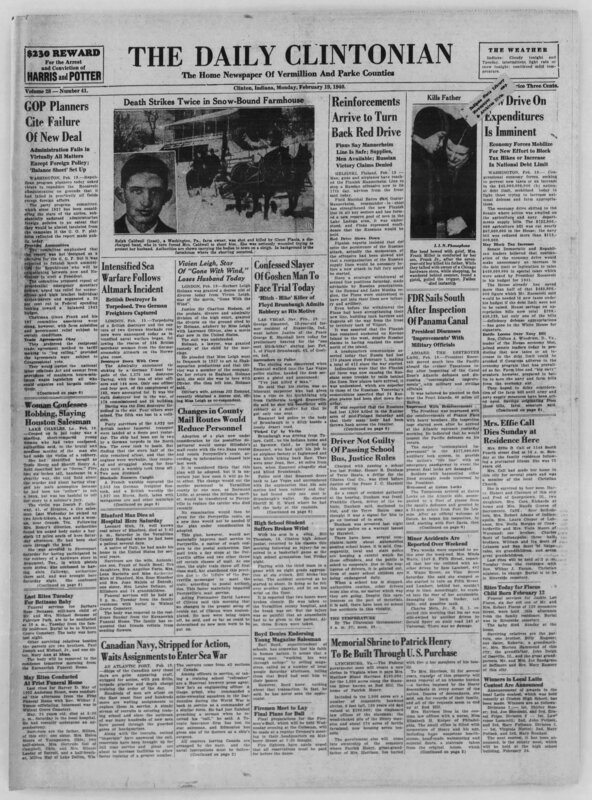 The reward mentioned to the left of the masthead was for E. C. Harris, who stole the money from a $26,000 Clinton bond issue, and for Earl "Doc" Potter, a former cemetery superintendent who had embezzled city funds. Submitted by Dbell on Sat, 01/27/2018 - 8:44pm. Heat a deep fryer load of oil, put in a basket, and pour in the kernels. Cover(!!) and wait until the popping slows to a stop; lift out the basket full of popcorn. Submitted by tvine on Sat, 01/27/2018 - 7:45pm. 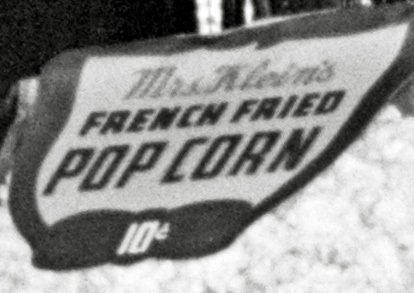 What in the world is french-fried popcorn? I want some! I'd kill to have that light fixture! Submitted by Irish on Sat, 01/27/2018 - 6:48pm. There's so much going on in this photo. The more I look at it, the more questions I have. Submitted by Iscovescu on Sat, 01/27/2018 - 3:26pm. His change dispenser is on the counter to his left. Submitted by racco on Sat, 01/27/2018 - 2:18pm. And I see Sen Sen in the background. They tasted like soap to me. Submitted by Ice gang on Sat, 01/27/2018 - 12:32pm. am I reading that right? ?